I've been watching past seasons of "Project Runway." How did I not know about this show before? Probably because I'm not a big TV watcher. But, this one...I'm hooked on. I love the challenges...the creativity it takes to make something that stands out from the crowd. Not an easy task. In one of the finales, I was struck by something the judges said about one of the final three contestants, who did not win the big prize. They had commented that one of the pieces in her collection looked a lot like another, very famous, designer from years past. Needless to say, she was heartbroken...but not just because she wasn't the big winner. She was in tears and humiliated that the judges thought she had copied another designer. I really felt for her. To be accused of something, that is in no way true, is extremely damaging to one's creative spirit and confidence, not to mention very damaging to the reputation. It presses on the soul and stifles creative happiness. From the observer's standpoint, it's an easy thing to get caught up in the piling on of a fellow artist but, a caution: know both sides of the story. Now, I'm no fashion guru. I have no idea weather or not this gal borrowed from another designer. The real point, for me, was her response to the judges. She told them that she never looks at the work of other designers. Then the judges said something that really stuck with me...they suggested she educate herself about what was going on in the fashion world, past and present. I totally get why they would tell her that...for her own protection. I've heard artists say things like "I never look at other artist's work because I don't want to be influenced" "I don't look at art books or magazines" "I don't know what other artists are doing" "I'm completely self-taught." But, the truth is, none of us live in a bubble. While we are all born with certain talents, no one is truly and completely self taught. No man is an island. The great majority of us have been taught and/or influenced by someone else. Even if it's as small a thing as looking at photos or books, instruction manuals or....osmosis! As artists, we're all influenced by the things we see every day and by the people we associate with...often other artists. We absorb creative ideas, we can't help it...we soak it in. And, it amazes me how many of us come up with the very same idea, at the very same time...probably an idea that has already been done at some point in the history of the world. It happens all the time. But, I do agree with those Project Runway judges; you must know what's going on in your field. You have to educate yourself, as much as possible, on what other artists are doing. That knowledge helps protect your own artistic integrity. As talented as that Project Runway designer is, the judges gave her some very wise advice. As tough as it was for her to hear, if she accepts that advice, applies it wisely and continues moving forward, she'll have grown as an artist. Marie is a wonderful teacher...clear and concise. Run...don't walk!...over to her blog and sign up for Digital Magic! Oh, what fun we're having in class! My Build Zone students are just getting started and, having watched the first few videos, some of them are constructing some pretty amazing elements. 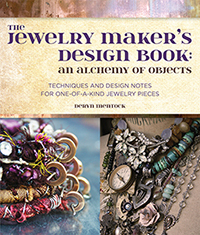 They're wrapping, snipping, twisting and turning their way into expert jewelry makers. It's such an amazingly gratifying feeling to hear from them how much they're enjoying the process. I've already caught their excitement and reflected it back to them in a bonus video, this week. I always struggle with wanting to give them ALL of what I know. The reality is that I end up throwing SO much out there but I'd rather that...and have them all happily flying along, trying to keep up...than not be challenged. Wanna join the fun? I'll be taking registrations for this workshop until April 1st....click here. Lis was also a student of mine in the online Towers workshop I offered with Sharon Tomlinson. Great news on this...we're fixin' to (that's how we say it, here in Texas) offer this class again. It was so extremely popular and well received...Sharon and I were just thrilled. But, not everyone got into class that wanted to; it's a busy life! So, we're looking at opening up registration very soon and possibly starting class in mid-March. Stay tuned for that! This lovely sketch by the very talented Pam Carriker. Did you know she has a new book out? Twist and shout...hammer...turn...heat...connect...love your links! Over the course of the last few weeks I've been uber-focused on class samples, photos, video editing, website making...not to mention getting my classes prepared for this event. But, the big day is almost here... Monday is day one of my new online class, The Build Zone and I can't wait to begin. Thank you all for your overwhelming response and enthusiasm...I think I'm as excited as you are! I've got a great group of artists/students for this workshop and it's going to be tons of fun. I have a feeling I'll be as inspired as anyone in class! If you haven't joined us yet, registration will remain open until April 1st, so you can jump in any time. Just click here for more info. Thanks again and I'll see you in the zone! Have you seen this? Coming from a sweet and beyond-talented man who's inspired so many of us...this is some good stuff. I think you'll want it. It's you! Grab your hardhat and head over to the construction zone. You're the winner of a spot in my workshop, The Build Zone. Drop me an email, Leslie, and I'll get you set up. Registration is still open for the workshop and, again, thank you all who played along and took a blog button! I thought it would be fun to up the ante on my little giveaway (previous post.) So.......If you grab one of my blog buttons......and put it in the sidebar of your blog.....you'll get a chance to win a spot in my new online workshop, The Build Zone. I'll also send you the bag of goodies I promised. Doesn't that sound like more fun?! Here's the deal: grab a button, or both buttons (the code is posted above), leave me a comment in the post below and in a couple of days I'll randomly draw a winning name. This feels a little like bribery but the truth is, I love to be generous with what I've been blessed with. Thanks for grabbing and good luck! I once jokingly mentioned to a friend that I'd like to see my name in lights. He surprised me with a neon light custom made for me...my name in cursive writing. I have still have it and it's glow never fails to give me a tiny thrill. Having a grab button for my blog feels a little like that! I'm not sure why I haven't offered one before this except that "putting myself out there" is hard. It's not my first thought and I'm not great at it. But, I do love this pretty little button! If you are so inclined to grab it for your blog or site, I would be ever so grateful. You can get the code from my right sidebar (or scroll down.) Easy peasy...just cut and paste. I have one more little bag of goodies, similar to the one shown above. I'm anxious to see where these little buttons find a home so, if you put one up on your site, leave a comment on this post and I'll give the goodies to a randomly drawn button grabber!